When you arrive for the first time – you will meet with an Intake Counsellor who will discuss your needs and tell you about programs and services that will help you. Our Resource Room has job postings, print resources, a photocopier, fax, scanner and printer along with 16 computers which are Internet ready for your use. 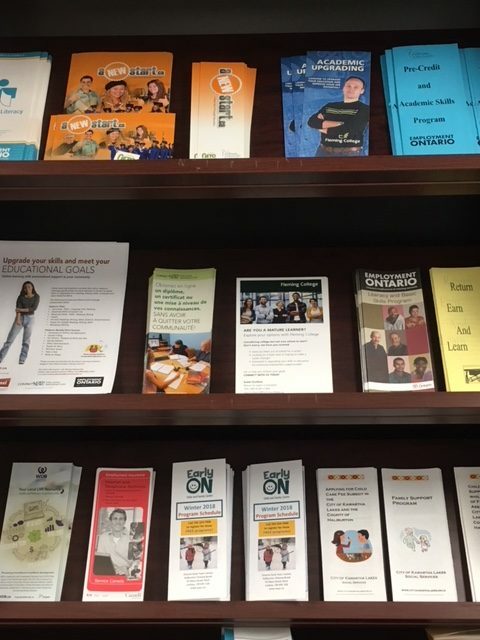 The Resource Room is staffed by Employment Counsellors who can assist you with accessing information and can provide self-help guidance and suggestions. Individual Employment Counselling is available for youth and adults. We can help you identify your skills, research a new career, implement an effective job search or apply for funding to return to school or start a business. A variety of Workshops are held monthly. These include an intensive 3-day Job Search Strategies, Career Direction, Targeting Your Career, Success at Work, Dealing with your Digital Dirt, Managing Change, Customer Service Excellence, Smart Serve, Career Research and Trends, and Apprenticeship to name a few. Each month local employers are invited to speak about their businesses and their hiring processes. Volunteer and Community Information Centre: volunteer opportunities and community information on Health and Social Service agencies can be found online at fourinfo.com. Dial 211 on your phone to be referred to health and social service agencies or to get information. Student services are offered year round. More comprehensive student services are offered between May and August. Employer services include free job postings and résumé screening. We can also assist employers with job fairs for a small fee. Our Job Developers assist businesses with their hiring needs and provide information on subsidized placements and hiring incentives. Our Website: vccs.work is available anytime. Individuals can register on-line, view job postings, or read more about our services. Employers can post a job on-line. The staff will greet you in a friendly, courteous manner. Staff will wear name tags so you can easily identify who can help you. We will try to answer your questions promptly or refer you to the person that can provide the information you need. If it is your first time here, we will have an Employment Counsellor meet with you to tell you about the programs and services that are available. You will be informed upon arrival how long it will be before you will get to see a Counsellor. You should not have to wait longer than 10 minutes for pre-booked appointments. If it is unavoidable, you will be informed of how long the Counsellor will be. You should not have to wait longer than 5 working days to see a Counsellor. If it is unavoidable, another staff member will be made available to assist you. We will have available some type of service for everyone who enters our doors. If you do not have an appointment, the reception staff will find out if the Counsellor you want to see is available. Staff will answer the telephone promptly and courteously within 4 rings and will give their name and our organization. Voice mail messages will be returned by the next working day. We will keep appointments we have made with you, but should we be unable to, we will inform you as soon as possible or offer another staff member to help. We will follow up on your progress while you are job searching or in training and after you are employed. We will evaluate your experience with us. Make an appointment where possible when you wish to see a Counsellor in person. Be polite and courteous to VCCS staff and other customers using VCCS facilities. Use your PIN number when you enter or leave our building. Tell us when you are happy with the service and where you think improvement would enhance our service delivery. Keep your information with us current if you are still job searching and celebrate your success with us when you have found work! We encourage you to comment on the service you have received. We welcome all constructive feedback to help us improve our services. Write a letter or request to talk to a Program Supervisor, the Assistant Executive Director, or the Executive Director. You will receive a response within 7 working days. If we are unable to keep to this target due to exceptional circumstances, you will be informed of the reason and given a new date by which you can expect to receive a response.